Be the first to share your favorite memory, photo or story of Cristina. This memorial page is dedicated for family, friends and future generations to celebrate the life of their loved one. 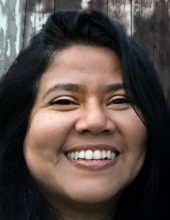 Cristina Maria Barros Da Costa Pyper, 50, of Rockford passed away on March 26th, 2019, in her home surrounded by family after a valiant battle with cancer. She was born on September 17, 1968, in Rio de Janeiro, Brazil, to Marleny Barros Da Costa and Jorge Da Costa. Cristina grew up in Brazil and married Jeffrey Pyper in 1989. Later they moved and settled in Rockford to raise their family. Throughout her life Cristina had a wide variety of interests and was a life-long learner. Her greatest joy was clearly being wife and mother to her family. She invested deeply into nurturing and educating Nate and Ana in their early years and relished guiding them into adulthood. The infectious love she personified spilled out to everyone that crossed paths with her. Her love of God was her foundation. Love, comfort, and encouragement were demonstrated powerfully through her. She taught Spanish (in her 3rd language) for elementary students at Christian Life School in her 30s. In her late 40s she began to pursue a degree in Math so she could help children struggling with Math to succeed and enhance their academic journey. Cristina finished her education at Beloit College in 2018 with a Bachelor of Science. Her majors were Mathematics and Education with a minor in Philosophy. Survived by her husband, Jeffrey; children, Nathan Pyper and Ana Pyper; mother, Marleny Barros Da Costa; brother, Jorge Antonio (Suely) Barros. Preceded in death by her father, Jorge Da Costa; brother, Jose Jorge Barros Da Costa. Memorial service will be held at 11:00am on Saturday, March 30th, 2019 at City First Church, 5950 Spring Creek Rd. Rockford, IL. Visitation will be held from 8:00am until time of service Saturday at the church. Memorial donations can be made to Breakthrough Urban Ministries. "Email Address" would like to share the life celebration of Cristina Maria Barros Da Costa Pyper. Click on the "link" to go to share a favorite memory or leave a condolence message for the family.